We are awakening within you memories of who you have been in your past lives and transmitting the energy necessary for you to integrate those past life versions of you. 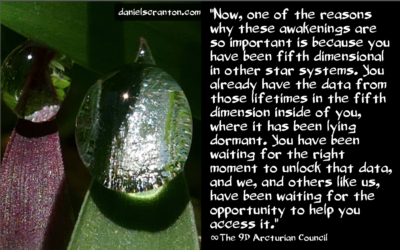 We are not just awakening past life memories and aspects of you from the Arcturian system. We are activating all past lives that you have led in other parts of the galaxy. Now, one of the reasons why these awakenings are so important is because you have been fifth dimensional in other star systems. You already have the data from those lifetimes in the fifth dimension inside of you, where it has been lying dormant. You have been waiting for the right moment to unlock that data, and we, and others like us, have been waiting for the opportunity to help you access it. Again, the reason why you are more ready now than you ever have been in this lifetime is because of how you have handled the most recent energy surges that have been coming to planet Earth from all across the galaxy. You all demonstrate an ability to handle these high frequency energies, and also an ability to assimilate energies from different star systems. And that all shows your readiness to unlock your past life memories and the versions of yourself that you have already been on these other worlds in these other star systems. So now you can expect to amplify the vibration that you are sending out, and you can expect to receive more from all of your galactic brothers and sisters. You can also expect to access more of your fifth dimensional abilities, as well as more of your memories from your dreams and astral travels where you connect to your galactic brothers and sisters. This is a time of great integration, and you are re-assembling the parts of yourselves that have been long forgotten and have been lying dormant within you for far too long. We are happy and honored to be able to reintroduce you to these aspects of who you are.